Another hit to the head, and the escaping bandit is out cold. 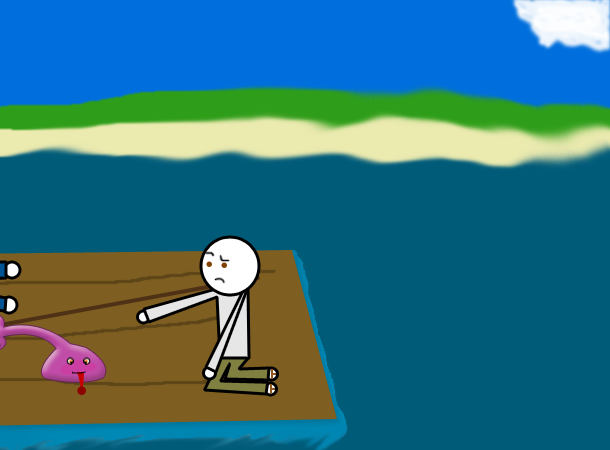 He and his friend are pushed into the river, and the jelly monster then squeezes through the cage. The three of you gather your things and set off on your rafting expedition once again. Clyde says "Boy, that was a close one. It looks like now we're in for some smooth sailing for a while. We probably won't need to use the poles, but you could push us along if you want to. Personally, I think I'd like a nap pretty soon. Unless you know a better way to pass the time?" Fox-Fool: Tell him that he can take a nap, and you will watch for anything bad, and that you will wake him up if something does happen. Robowurmz: For something else to pass the time with, use the whimsy capsule! blue moon: I would actually try and get the jelly monster to absorb the Whimsy Capsule, so he can use it over and over again. 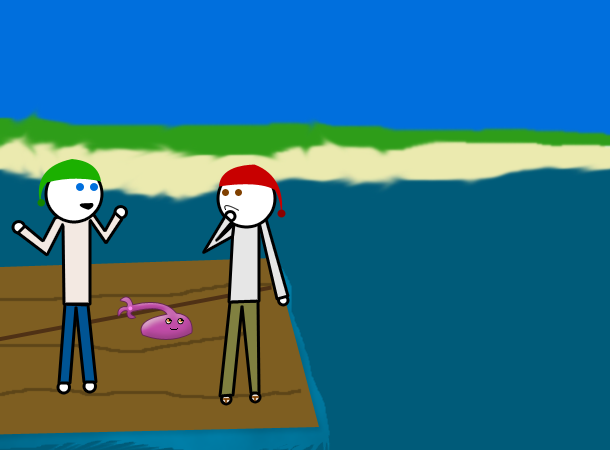 Maybe I can get the next post betray this guy, just like I did in the pirate story... That was funny. blue moon: That seems... unproductive. The only "someone" around is your buddy, and you should hit him with something hard enough to give him amnesia so eh won't remember it. Chang: What? ... no, a shield bash is always productive. He could his his little blob thing as a shield and shield bash his friend. That way he would be practicing his shield bashing monk skills and his friend would be practicing being able to take a hit. I see only pluses in those outcomes. Clyde gets a pillow from his luggage and begins to nap in the warm sun on the raft. He's sound asleep, and you sit at the front of the raft looking for anything dangerous or otherwise interesting to happen. 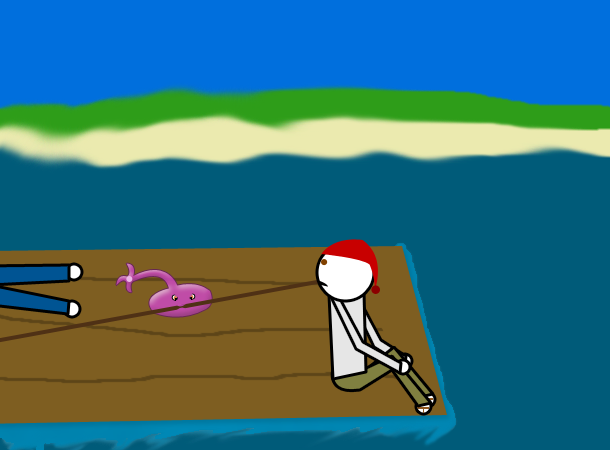 Some time passes by, and you eventually notice that the jelly monster is behind you, vigorously chewing on one of the raft poles. Could he be bored, or perhaps hungry? If that's the case, what might a jelly monster eat? Probably not wood... Then again, stranger things have happened. blue moon: Try and see if he eats cloth, like your hat. Also see if he'll eat one of the Whimsy Capsules. Chang: Hey, i'm moving in on friday too. I thought you wouldn't make it until saturday. blue moon: I was thinking that the jelly monster would absorb it. He'd be really cool if he had the Whimsy Capsule in him. In an attempt to quell the jelly monster's apparent hunger, you hand it your hat. The hat is abruptly devoured, and it seems that this meal has made the jelly monster grow a bit larger. Well, that was fun for a few minutes... What to do now? Chang: go swimming. That's always healthy. Take jelly with you. maybe it could use the water. Ragdollmaster: BAH! You beat me :( ah well... hmm i think we should jump in the water and swim a little but don't go any where too far from the raft. 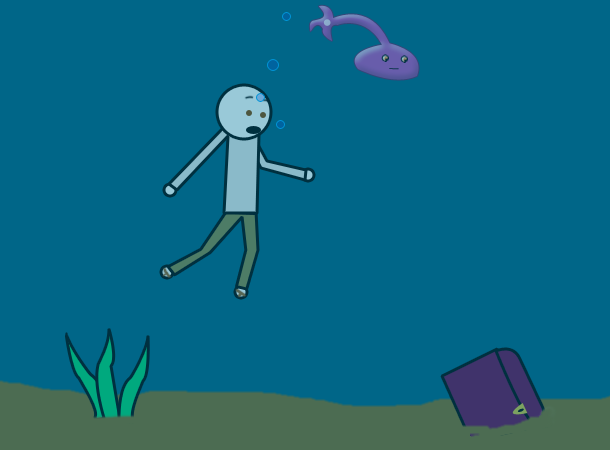 You and the jelly monster hop into the cold river water again and swim around in the current. Much fun is had by both of you, but you are soon faced with a couple of crises. For one thing, the raft is beginning to move down the river faster than you are. Additionally, you just spotted some kind of awesome abandoned chest at the bottom of the river. What kind of thing should you do now? Can you catch the raft? Can you lift the chest? Can you come up with more creative ideas than these? ONLY TIME WILL TELL. 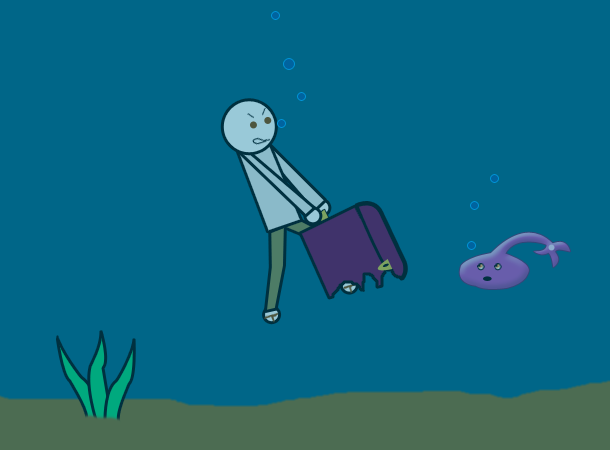 Tsar: Attempt to retrieve the chest, and have the Jelly Monster attempt to open it. You grab at the chest's handle, and the jelly monster is ready to help you with it, but you soon discover horrifically that it is only half a chest! It must have eroded or something. Or, if it was already broken, then obviously someone would want to throw it in the river. Who can say? What's the plan now?